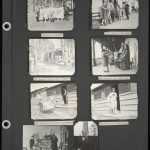 Yellowstone Album, Volume 1 This album contains photographs of National Park Service personnel, cooperative bureaus, organizations, public utility operators, Yellowstone residents (exclusive of employees), the Mummer's parade of 1938, Mammoth schools group portraits, awards (NPS personnel). Inclusive dates of creation are 1908-1958, bulk dates 1925-1940. 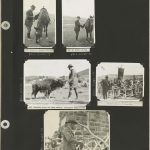 Yellowstone Album, Volume 1A This photo album includes images of Yellowstone National Park personnel, Superintendent Roger W. Toll, NPS Directors Arno B. Cammerer, Horace M. Albright and Family, Stephen T. Mather, Secretary Wilbur and Party, Yellowstone National Park officials, administrators, office force and heads of departments, educational division personnel, and ranger department personnel. Inclusive dates of creation are 1914-1957, bulk dates are 1920-1935. 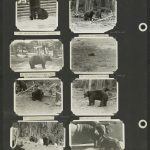 Yellowstone Album, Volume 2 This album includes images of notable visiting parties and visitors in the first half. Notable visiting parties include: United States President Warren G. Harding party of 1923, United Sates President John Calvin Coolidge, Jr. party of 1927, visiting scientists, Floyd Gibbons' pack trip, American Legion party 1923, miscellaneous special parties and individuals, including: Crown Prince and Princess of Sweden in 1926 and Valley Ranch Girls party of 1923. 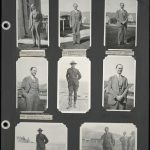 Included in the latter half of the album are park personnel portraits. Inclusive dates of creation are 1922-1953. Yellowstone Album, Volume 3 This album includes images of locations and natural features. Sections include: rivers, calcite springs, Mammoth phenomena (exclusive of Jupiter Terrace), Jupiter Terrace, miscellaneous hot springs, pools and steam vents. Inclusive dates of creation are 1905-1957. 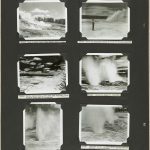 Yellowstone Album, Volume 3A This album includes images of natural features, namely geysers. Sections include: Old Faithful Geyser, Imperial Geyser, Lone Star Geyser, Monuments of Geyser Basin, Norris Geyser Basin, miscellaneous geysers, Seven Mile Hole Area, and Solfatara Plateau. Inclusive dates of creation are 1905-1956. 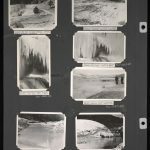 Yellowstone Album, Volume 4 This album includes images of geology, botany, and many locations within and outside of Yellowstone National Park. 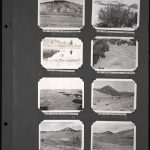 Sections include: miscellaneous park scenery, flowers, botany, miscellaneous geological phenomena, geology, Gallatin Petrified Forest, Lamar Valley Petrified Forests, National Parks and Monuments (exclusive of Yellowstone), Big Hole Battlefield National Monument, Zion Park Country, country between Zion Park and Salt Lake City, Crow Indian Country Black Canyon and Vicinity, country north and adjacent to park, miscellaneous scenery (adjacent to park), Silver Tip Ranch, Jackson Hole ranches, miscl. dude ranches, and miscellaneous park scenery. Inclusive dates of creation are 1904-1956. Yellowstone Album, Volume 4A This album includes images of winter, snowscapes and sports. 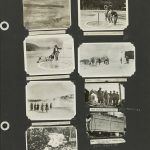 Sections include: winter scenes, winter sports, and Montana Day. Inclusive dates of creation are 1915-1957, bulk dates 1930-1957. Yellowstone Album, Volume 5 This album includes images of various waterfalls, canyons, and other locations. 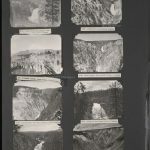 Sections include: Yellowstone Falls and canyon, Yellowstone Falls, falls (exclusive of Yellowstone Falls), miscellaneous falls, Virginia Cascades, canyons (exclusive of Yellowstone Canyon), Tower Creek Basin, and Virginia Meadows. Inclusive dates of creation are 1905-1957, bulk dates are 1925-1955. 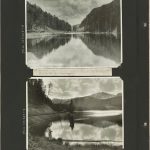 Yellowstone Album, Volume 5A This album includes mostly images of mountains and lakes as well as panoramic landscape images. 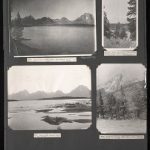 Sections include: Teton mountains, mountains, miscellaneous mountains, Bandy's survey of east boundary of Yellowstone National Park (1932), Yellowstone Lake, and lakes. Inclusive dates of creation are 1912-1957, bulk dates 1930-1957. 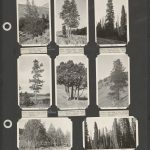 Yellowstone Album, Volume 6 Sections include: reforestation and nursery, nusery equipment, seed collection, horticulture research, trees and forest, fire suppression, forest fires, game research. Inclusive dates of creation are 1904-1956. 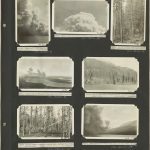 Yellowstone Album, Volume 6A Sections include: reforestation and nursery, nusery equipment, seed collection, horticulture research, trees and forest, fire suppression, forest fires, game research. Inclusive dates of creation are 1904-1956. 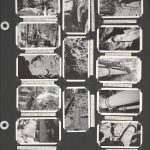 Yellowstone Album, Volume 6B Sections include: scientific research thermal, trees killed by miscellaneous agencies, forestry research, mapping crew, forestry research - insect control work, horticultural research, range study plots, and some animal observations. Inclusive dates of creation are 1929-1955. 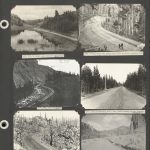 Yellowstone Album, Volume 7 Sections include: roads (general), Cody Road, Cooke Road, Gardiner Canyon Road, bad roads. Inclusive dates of creation are 1905-1955. 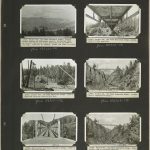 Yellowstone Album, Volume 8 Sections include: road construction and maintenance, roads, and traffic. Inclusive dates of creation are 1911-1954, bulk dates are 1920-1935. 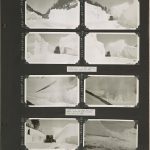 Yellowstone Album, Volume 9 Sections include: Sno-planes, roadside cleanup, sloping, general landscaping, and snow removal. Inclusive dates of creation are 1901-1957, bulk dates are 1925-1940. 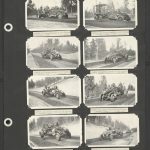 Yellowstone Album, Volume 10 Sections include: parking areas, some congestion in the artist point parking area (July 5th, 1947), parking, road and formation signs, markers (boundary G.S., etc. 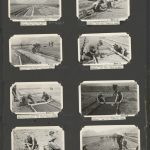 ), boundary markers, boundary fences, government operations, wood yards and cutting areas, wood cutting, government operations, telephone construction and maintenance, telephone lines, irrigation department, irrigation, rock quarries, gravel pits, vista clearing, government equipment, miscellaneous operator's equipment, contractor's equipment, conditions requiring attention. Inclusive dates of creation are 1913-1957. 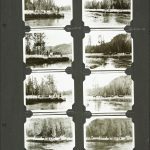 Yellowstone Album, Volume 11 Sections include: bridges, bridge construction, docks, boats, sidewalks, nature and formation trails, trails, and trails (exclusive of nature and formation). Inclusive dates of creation are 1905-1956. 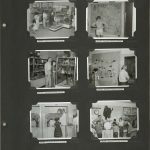 Yellowstone Album, Volume 12 Sections include: dump grounds, cleanup of dumps, cleanup - general, sanitation department, water systems, water supply, pipe lines, canyon power plant, sanitation department comfort stations, sanitation department incinerators, and fumigation - spring cleanup. Inclusive dates of creation are 1930-1938. 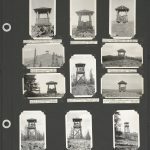 Yellowstone Album, Volume 13 Sections include: information stations, ranger - naturalists quarters, protective (ranger) department buildings, game ranch, buildings, checking stations, lookout towers, stables and barns. Inclusive dates of creation are 1913 - 1957. 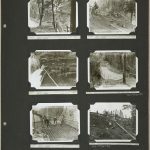 Yellowstone Album, Volume 13A Sections include: buildings, buildings at Mammoth, buildings at Mammoth (exclusive of residence and museum), buildings at Mammoth, residence and barracks, road camp buildings, building maintenance, government buildings outside of Yellowstone, water guaging stations etc., and miscellaneous structures. Inclusive dates of creation are 1905-1955. Yellowstone Album, Volume 14 Sections include: history, localities, Custer Battlefield National Monument, historical buildings - hotels, lunch stations, etc., buildings, historical buildings - governments, historical equipment, history - persons, communities, auto camps, mammoth auto camping ground, camp grounds, outside institutions - Georgetown Lake Fish Hatchery and Warm Springs Game Farm. Inclusive dates of creation are 1878 to 1959, bulk dates are 1921-1957. 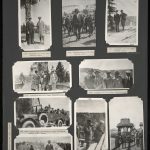 Yellowstone Album, Volume 14A Sections include: hotels and inns, operators' buildings, lodges, transportation villages, transportation company buildings, housekeeping cabins and offices, stores, cafeterias, etc., Haynes pictures shops, dormitories, railway stations, residences, swimming pools, celebrations and ceremonies, Teton dedication, West Yellowstone opening - 1925, golden anniversary celebration, Howard Eaton Trail dedication, ceremonies and celebrations, dedication Canyon Visitor Center, and Easter sunrise services. 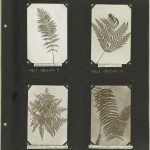 Inclusive dates of creation are 1907 to 1957. Yellowstone Album, Volume 15 Sections include: visitors, visitors in buses, Montana Game Commission - 1936, visitors - general, guide parties, park visitors and bears, park visitors at canyon, park visitors photographing elk, park visitors fishing, park visitors and the geyser basins, park visitors and petrified tree, park visitors at Yellowstone Lake, park visitors at Old Faithful, park visitors, guide parties, naturalist education program, auto caravan, modes of transportation - railroad transportation, transportation - miscellaneous, accidents, automobile accidents, and accidents - other. Inclusive dates of creation are 1920-1957. 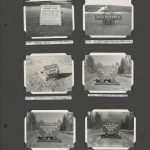 Yellowstone Album, Volume 16 Sections include: antelope, antelope trapping operation at Stevens Creek to obtain animals for Montana State Fish and Game Commission - January 1947, grizzly bears, black bears, bear feeding grounds, grizzly bear grounds immediately prior to removal in the spring of 1946, and grizzly bears. Inclusive dates of creation are 1924 to 1957. 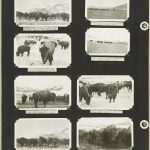 Yellowstone Album, Volume 16A Sections include: buffalo - large herds, buffalo - small groups, buffalo - individuals, buffalo - round-up, stampede activities, buffalo - catching, shipping, etc., bison at Antelope Creek Show Corral, buffalo, and buffalo carcass removal from Yellowstone River 1946. Inclusive dates of creation are 1923-1956. 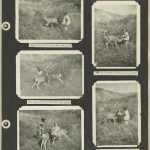 Yellowstone Album, Volume 17 Sections include: deer - groups, deer - individuals, moose - groups, moose - individuals, Mt. 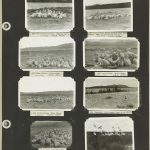 sheep - groups, and Mt. sheep - individuals. Inclusive dates of creation are 1926-1957. 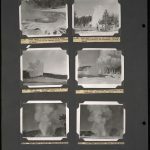 Yellowstone Album, Volume 18 Sections include: beaver and their workings, coyote, fox, golden-mantled ground squirrel, marmots (woodchucks), martin, otter, picket pins, pine squirrels, porcupine, rabbits, miscellaneous animals, birds, miscellaneous birds, nests and eggs, caspian tern, cormorant, golden-eye ducks, sandhill cranes, birds - Molly Islands, fish hatchery buildings, fish, and fish and fishermen. Inclusive dates of creation are 1904-1957. 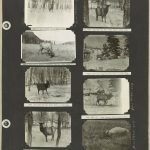 Yellowstone Album, Volume 19 Sections include: elk - large herds, elk - small groups, elk - individuals, elk catching corral and chute and tagging operations, elk catching, tagging and shipping, etc., and snow removal. Inclusive dates of creation are 1919-1957. 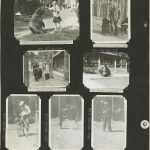 Yellowstone Album, Volume 20 Sections include: Mammoth Museum, Norris Museum, Madison Museum, museums, information offices, and trailside shrines, Old Faithful Museum, Fishing Bridge Museum, Canyon Visitor Center, exhibits in Canyon Visitor Center, Big Hole Museum and area, museum equipment, museum exhibits, amphitheaters, misc. trailside structures, vandalism, intrusion of private tennis court on Opal Spring and its removal, and pollution of streams. Inclusive dates of creation include 1923-1955. 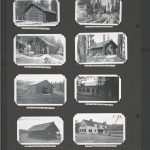 Yellowstone Album, Volume 21 Sections include: emergency conservation work - camps and activities, buildings--erection of radio tower, construction of buildings, barns and caches, razing buildings, compound, loading ramps, aerial views of different sections in the park, Mission 66, West Thumb Amphitheater, Mammoth Amphitheater, Canyon Village Opening, Canyon Amphitheater, Canyon Village Dedication, Fishing Bridge Campground, and spike camps. Inclusive dates of creation are 1933-1957. 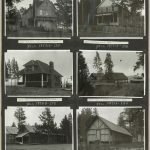 Yellowstone Album, Volume 22 Sections include: park buildings in 1917 and government and concession buildings in Yellowstone. Inclusive dates of creation are 1895-1917. 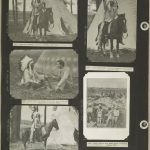 Yellowstone Album, Volume 23 Sections include: Roger W. Toll, Arno B. Cammerer, Horace M. Albright and family, Stephen T. Mather, Secretary Wilbur and party, officials, general, administrators, office force, heads of departments, educational division personnel, ranger department personnel, cooperative bureaus' and organizations' personnel, public utility operators and personnel, ranger conference, pack trips, President Harding's party, visiting scientists, miscellaneous special parties and individuals, American Legion Party, rivers, Old Faithful Geyser, Imperial Geyser, Lone Star Geyser, Norris Geyser Basin, miscellaneous geysers, Mammoth phenomena (exclusive of Jupiter Terrace), Jupiter Terrace, miscellaneous hot springs, pools and steam vents, winter scenes, miscellaneous park scenery, botany, flowers, miscellaneous geological phenomena, Gallatin Petrified Forest, Lamar River Petrified Forest, National Parks and Monuments (exclusive of Yellowstone), Scott's Bluff National Monument, Custer Battlefield National Monument, miscellaneous scenery (adjacent to park), miscellaneous dude ranches, Teton Mountains, and miscellaneous mountains. Inclusive dates of creation are 1894-1952. 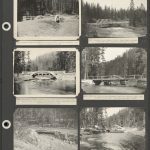 Yellowstone Album, Volume 24 Sections include: lakes, Yellowstone Falls and Canyon, falls (exclusive of Yellowstone Falls), miscellaneous falls, insect control work, game research, trees and forests, forest fires, Cody Road, Gardiner Canyon Road, Gardiner Canyon Road (proposed roadsites), bad roads, roads (general), road construction and maintenance, roadside cleanup, snow removal, parking areas, road and formation signs, marker, boundary, G.S., etc., government operations, operators' equipment, government equipment, bridges, boat docks, nature and formation trails, trails (exclusive of nature trails), sanitation department, N.P.S. buildings, Mammoth, buildings at Mammoth, road camp buildings, ranger naturalists quarters, ranger department buildings, buffalo ranch, north entrance arch, Gardiner, Montana, government buildings outside of Yellowstone, hotels and inn, buildings, hotels, cottages etc., Mammoth, lodges, housekeeping cabins and offices, railway stations, history - localities, historical buildings - hotels, lunch stations, etc., history - persons, historical objects, communities, and auto camps. Inclusive dates of creation are 1878-1939. Yellowstone Album, Volume 25 Section headers include: Teton dedication, golden anniversary celebration, Howard Eaton Trail dedication, Mather plaque dedication, celebrations and ceremonies, visitors in busses, visitors - general, guide parties, transportation - miscellaneous, Indians, antelope, grizzly bears, black bears, negatives removed from files (bears), buffalo, deer - groups, deer - individuals, moose, moose - groups, mountain sheep - groups, mountain sheep - individuals, beaver and beaver work, coyote, Golden-Mantled Ground Squirrel, marmots (woodchucks), martin, picket pins, porcupine, miscellaneous animals, miscellaneous birds, fish and fishermen, elk - small herds, elk - large herds, elk - individuals, elk catching, tagging and shipping, etc., Mammoth museum, Norris museum, Madison museum, Old Faithful museum, fishing bridge museum, museum equipment, museum equipment, miscellaneous trailside structures, and buildings construction. Inclusive dates of creation are 1910-1939. 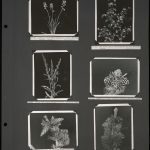 Yellowstone Album, Volume 26 Images in this album include plant specimens. 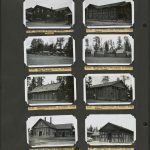 Yellowstone Album, Volume 27 Images in this album include parks employees, ranger stations, various flora and fauna, campsites, and park structures. Inclusive dates of creation are 1928-1933. Yellowstone Album, Volume 28 Section headers include: earthquake results, aerial photographs, buildings, slides - roads, Director Wirth's inspection trip to Yellowstone National Park following earthquake, pictures taken by Park Service Staff after earthquake of August 17, 1959 - aerial views, rock slides and road damage, group of pictures taken of earthquake damage by the Engineering Dept., pictures of the Secretary of Interior, Fred Seaton - trip to Yellowstone following earthquake, earthquake study 1959, earthquake study pictures taken by Alan Mebane. Inclusive date of creation is 1959. 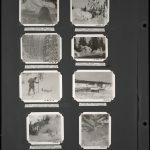 Yellowstone Album, Volume 29 Section headers include: ranger conference, Indians, pack trips - Yellowstone personnel, ranger activities, snow survey team, testing over snow equipment, ranger activities - law enforcement, ranger activities 1958. Inclusive dates of creation are 1860s to 1959. Yellowstone Album, Volume 30 Section headers: reserved for future Blacktail Deer Creek Construction pictures, public works projects - National Recovery Act program. Inclusive dates of creation are 1933-1941. 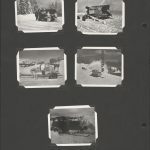 Yellowstone Album, Volume 31 Section headers: civil works projects - National Recovery Act program 1934, snow removal, heavy maintenance, general maintenance, construction roads, oiling and processing - surface betterments, signs, roadside cleanup, post-construction maintenance, construction, trails, construction - parking areas, construction - sewers, construction - water system, construction - buildings, machinery and equipment, miscellaneous, and scenery. Inclusive dates of creation are 1930-1943.